True Margrit takes piano-pop to new heights with their fifth release: Equipped with a pack of thematic inspirations including Shakespeare, mountaineering, and evolutionary destiny, True Margrit fashions brainy musings into catchy, piano pop-tastic tunes! Based in San Francisco, True Margrit is fronted by singer/songwriter/piano-player (and transplanted Knoxvillian) Margrit Eichler. True Margrit’s sound is fueled by Eichler’s husky/sweet alto, her aggressive piano-playing, her surreal & infectious tunes, and by the fleet-footed rhythm-section of Gary Hobish on bass and Andrew Bacon on drums. The act has been touring the west & east coasts featuring a long string of nightclub, radio, television, and in-store engagements. THE JUGGLER’s PROGRESS also features bay area guest stars—including virtuoso violin by Gloria Justen (of the Philip Glass Ensemble), lush backing vocals by Pam Delgado, and deft guitar by Jeri Jones ( both of whom are in San Francisco buzz-band, Blame Sally). 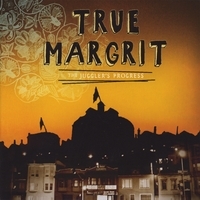 True Margrit has released four recordings: PEUT-ETRE la FENETRE, SYMPATHETIC MAGIC, DECEPTIVELY TRUE, SEAWORTHY, and the fifth: forthcoming on January 19, 2010, THE JUGGLER’s PROGRESS. The Juggler's Progress is a terrific production, densely packed with superstar songwriter Eichler's ambitious thematic terrain, the trio's trebuchet-like power, and a host of guests that enhance the complex, lush arrangements. Whether you feel up for unpacking the profound and insightful lyrics or not, this album has a multitude of pleasures--from the quirky, entirely original rockers Syllable, Opposite Man, and Lucy, to the more philosophical Metaphor, to the stunningly profound Casseroles and Thunderstorms. I don't hyperbolize when I say that Shakespeare--one of the touchstone inspirations for for the album--would have been damn proud. True Margrit gets better all the time. My favorite True Margrit album, and as of this writing their most recent. A baker's dozen of introverted lyrics married to extroverted, catchy tunes, propelled by the pistons of Margrit's left and right hands reminding us that piano is a percussion instrument. Hobish and Bacon on bass & drums have a lot to say in their own right, making it easy to forget this richly rocking sound is coming from a trio.